"Want a fun new food with a new concept? Challenge the stereotype of salad having to be healthy with this dish." Heat 2 tablespoons oil in a large skillet over medium heat. Cook and stir potato slices in hot oil until tender but not crispy, 10 to 20 minutes. Heat remaining oil in a skillet over medium-high heat. Saute ham in hot oil until heated through, 3 to 7 minutes. Cook bacon in a large skillet over medium-high heat, turning occasionally, until evenly browned, about 10 minutes. Drain and crumble bacon. Whisk barbeque sauce and ranch dressing together in a bowl. 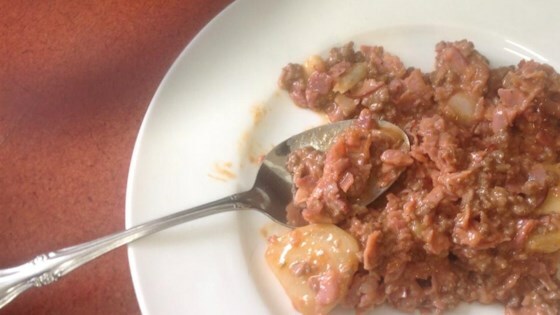 Stir potatoes, beef, ham, and bacon together in a large bowl; top with barbeque sauce mixture and toss to coat. See how to make a simple summer bean salad with garlic and mint dressing.